Caterpillar Forest Products recently introduced the Cat® 553C wheel feller buncher, the third model in the C-Series, launched fourth quarter 2011. “All of the performance, reliability, and serviceability advances that were built into the 563C and 573C are incorporated in the 553C. It just has a different engine,” says Matt McDonald, Caterpillar Forest Products product performance engineer. The 553C is equipped with the 174 hp Cat® C6.6 ACERT™ engine, while the 563C and 573C are equipped with the new Cat C7.1 ACERT engine. All engines meet EPA emissions requirements. John Deere announced the addition of a 9.0-liter John Deere PowerTech™ Plus 6090H Engine to its 700-Series Tracked Feller Bunchers and 700-Series Tracked Harvesters, replacing the existing 8.1-liter engine. The 9.0-liter engine is smart and reliable, featuring an electronically controlled high-pressure common rail fuel system to provide maximum power and fuel economy. “The large-displacement engine provides the power loggers need to get the job done quickly and efficiently, while using the least amount of fuel necessary,” says Neil Harber, product marketing manager, John Deere Forestry. The 9.0-liter engine delivers 241 HP at peak power, giving loggers maximum productivity and uptime, shift after shift. An extended, 500-hour engine oil service cycle, paired with extended filter capabilities, helps to lower daily operating costs. Kobelco Construction Machinery America recently introduced the SK170 full-size, high-performance excavator to the Kobelco Mark 9 excavator series. These new Tier 4 models include the SK210, SK260, SK295, SK350, and SK485 Mark 9 excavators. The SK170 Mark 9 delivers up to a 10-percent improvement in both fuel efficiency and productivity, while providing more power and faster engine response. “The Mark 9 excavators are the most fuel efficient machines Kobelco has ever built,” says Reece Norwood, Kobelco platform manager. The SK170 Mark 9 is equipped with the industry’s first selective catalytic reduction (SCR) emission solution for excavators. A new ROPS/FOPS certified cab provides a larger, more comfortable work environment, and a low engine cover and standard wide-angle rear-view camera improve operator visibility and productivity. Specifically tuned for use with the Terex® PT-100G Forestry compact track loader, the new Terex G-Series mulcher attachment is ideal for right-of-way work and vegetation management applications. Operators will experience leading-edge performance thanks to design innovations incorporated into the Terex G-Series mulcher attachment, including the latest power drive systems and cutting tooth technologies. “Operators using this Terex mulcher will be able to easily cut down large standing trees, up to eight inches in diameter, shave off large material, and mulch in both forward and reverse. The G-Series is designed with performance-enhancing features like the powerful drum-style mulcher that utilizes 36 double twin carbide teeth, allowing operators to quickly and efficiently clear and mulch a 61”-wide path. The drum-style mulcher also gives operators the ability to plane stumps up to 12” diameter to ground level,” says Jamie Wright, Terex product manager. Tisfoon Ulterior Systems, specialists in optimizing throughput and yield for cross-cut and rip saws, has introduced the Tisfoon Lumber Defect Scanner (LDS). With an extremely economical installation cost, the LDS puts a powerful defect detection system within reach of small and medium-sized shops. 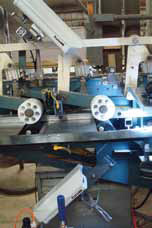 The LDS can be readily retrofitted on most existing cut-off saws with little downtime required, and can be installed directly inside the saw, requiring no additional material handling. 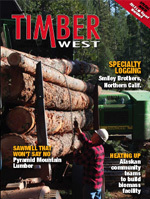 Because defective lumber no longer needs to be marked, plants can re-deploy 1-2 production personnel per saw. Most manufacturers recoup their investment in a Tisfoon LDS within 9-18 months.